What was US union boss Eliseo Medina doing in New Zealand? The new New Zealand Service and Food Workers Union (SFWU) is the rough eqivalent of the Service Employees International Union (SEIU) in the US. Both unions represent low paid service workers, both are Marxist led, are highly political and very influential with the main left party in their respective countries-the US Democratic Party and the NZ Labour Party. Eliseo Medina, vice president of the SEIU visited NZ in October 2009, where he worked with the SFWU and apparently met with Labour finance spokesman David Cunliffe. 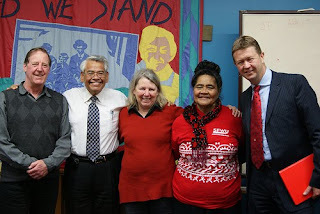 Left to right: Len Richards, SFWU Lead Organiser, Hospitals Campaign (Northern Region); Eliseo Medina, SEIU; Jill Ovens, SFWU National Secretary; SFWU Pacific Islands Komiti Matriarch Fili'iamata Fiu, David Cunliffe MP, Labour Party Finance Spokesperson. Read about "boss hating" mad Marxist Jill Ovens here and her husband loony left Len Richards here. Eliseo Medina was a guest speaker at the SFWU's October National Delegates Conference in Auckland. Eliseo gave a powerful speech to the conference about the need for unions to not only operate internationally to win power over the large international companies we were facing, but to also campaign internationally around immigration, healthcare and housing issues. Eliseo related the struggle of the SEIU in the United States to win immigration and healthcare reform as part of an overall goal of Justice for All. 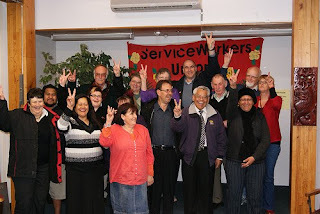 On the days before and after our conference Eliseo visited Wellington and Christchurch talking to SFWU members and organisers about the SEIU and the international partnerships to organise in cleaning and security. Justice for All-nice codeword for socialism. When a leading US marxist union boss like Eliseo Medina is linking up with Labour's cash cow the SFWU and Labour's finance spokesman, should we be concerned? You really are such a drama queen idiot Trevor. Still peddling that "very much the distinct possibility of the likelihood of a something or other" crap. Said it many times before - Grow Up Right Wing Boys and Girls ! Well that's some ugly, angry Anonymous.....speak to your chilgren Trevor.